I don't know why those "science types" insist on giving things scientific names that are incomprehensible (not to mention unpronounceable) to the general public. 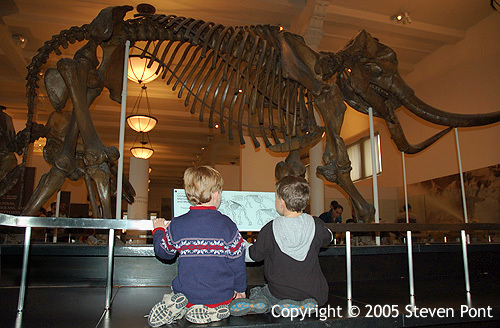 The Latin name of the beast that they boys are studying here is "Mammuthus primigenius", or some such nonsense. If you want kids to be interested in science throughout their lives, try making science at least a little interesting and fun. Compare the number of "Mammuthus primigenius" action figures an average first-grader owns to the number of T-Rexes he has. T-Rex has a much cooler name, a better reputation, and much more public exposure. In short, T-Rex had a much better PR company. Unless you are giving the technical names for Wile E. Coyote and The Roadrunner (which are Apetitius Giganticus and Tastyus Supersonicus, respectively), leave the Latin for the people going for their Ph.D in Ancient Roman History. That was the only picture where the two of them were actually looking at the dinosaurs instead of running from one computer station to another.